That title ought to confuse a few people…..
Today, I inflicted MY training plan upon my students, or more correctly upon anyone who showed up for my 8 am workout at Marie Kerr Park. My plan called for a 6 mile Tempo Run. Ideally, this would be 6 miles at Half Marathon Pace or 7 minutes per mile. Weather and running location, however, can affect pace. Somehow, I wanted to work this into a Hillview practice run. I came up with a plan. 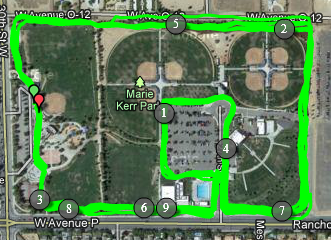 I arrived 20 minutes early and ran my 1.5 mile loop around Marie Kerr Park. MY 1.5 mile loop is a loop around the perimeter of the park, except you have to go IN and AROUND the swimming pool parking lot and you are allowed to take the path which cuts INSIDE the tennis courts and skate park on the corner. I only had 4 Hillview kids show up, but for some reason I had 5 former Hillview kids show up as well. I challenged them to see how many of the above loops they could complete in an hour. The High school kids did not want to push that hard. They did 2 and a half loops and then they quit. One of my Hillview boys took off really fast and stayed ahead of me for a loop, but then fell quite far behind on number two. He stopped at two. The two other boys ran slowlly but they completed all four loops. Gabby who ran with her sister finished 3. As for me, the conditions were not ideal for 7 minute miles. The dirt path at the park is flat, but it has this loose layer on top and every toe push off looses a bit due to slippage. The park itself is not flat. It looks flat as a pancake, but on closer inspection it is a tilted pancake. The south side of the park is 20 to 30 feet higher in elevation than the north side. This does not cause anything steep, but you do notice the difference running north or south. There was a 10 mph wind from the south west. So, the first half mile of each loop was flat and downwind, but almost entirely on the dirt. I averaged 7:02 pace on my 4 repeats of this section. The second half mile had the most noteable uphill (the east end of the park) and it was almost all into the wind, sans the last part when you went downhill and downwind into the parking lot. I averaged 7:13 on this section. The third section was also mostly into the wind and included just a little bit of climbing. I averaged 7:08 on this section. Two more weeks till Bakersfield…..
Nine more weeks till LA! Good job! You’ve got a great shot at a PR in Bakersfield.